She cites points he made in conversations with her. 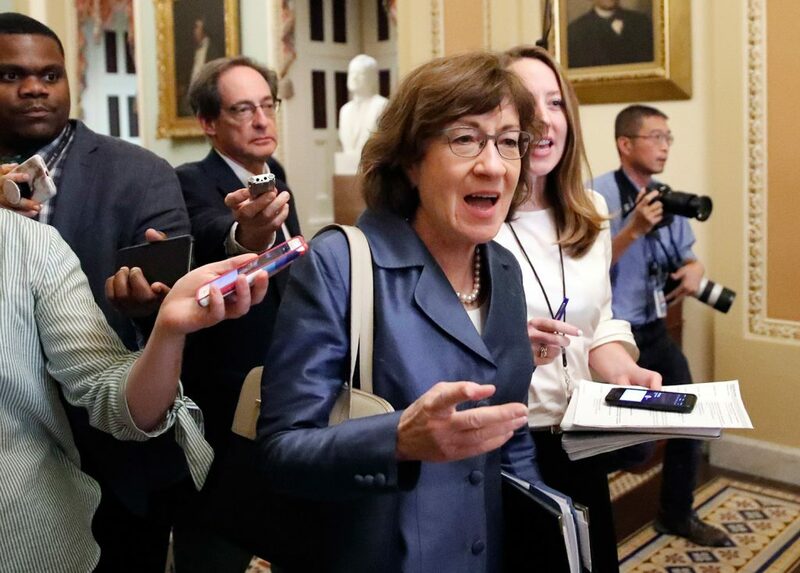 WASHINGTON — Sen. Susan Collins, a key swing vote in the nomination of Brett Kavanaugh, said again Tuesday she doesn’t think President Trump’s Supreme Court nominee would overturn the Roe v. Wade decision that legalized abortion because he said he respects precedent. Collins said she hasn’t decided whether she’ll vote in favor of confirming Kavanaugh to the court. She’s waiting to make a decision until after hearing testimony at a Thursday Senate Judiciary Committee hearing from a woman who accuses Kavanaugh of sexual assault during high school. The nomination would fail if Collins and another Republican join all of the Democrats in opposing Kavanaugh. Collins faces heavy pressure from conservatives to support Kavanaugh, and from liberals to reject him in part because he could cast a deciding vote to overturn or gut Roe. Kavanaugh declined during his confirmation hearings to say if Roe was correctly decided or if he would vote to uphold it as a justice. Collins said another reason she thinks the nominee wouldn’t do so is that he pointed to the duration of the precedent.